The Vapefly Wormhole RDA is named in remembrance of Steven Hawking. A worldwide known Physicist (died recently), who claimed that black holes could also be wormholes. Insinuating that parallel universes are possible. The design also “supports” its “Wormhole” brand name. Being an RDA that can let its user “travel” between two “parallel universes”. That of an actual single-coil RDA (and not just a usual “single-coil build” of a dual-coil RDA) and that of an actual dual-coil RDA. In the case of a single-coil setup, the design of the internal case-selectable adaptation of the airflow system does not allow for the incoming air to be dispersed to the side of the dual-coil base that has no coil installed. 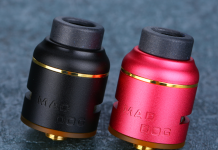 It’s a 24mm-diameter single/dual-coil RDA with a PMMA 810 drip tip (Goon-styled). Its top-cap consists of two separate parts: the lower SS (Stainless Steel) part and the upper PMMA (heat insulating) part. The two together are cooperating simultaneously for the air to be fed from two directions. Side- and laterally-below are also selected by choice. 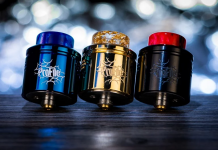 Actually, the Wormhole RDA comprises an internal and an external air-feeding system. That lead together to an intense vapour’s flavour. An 810-to-510 driptip adaptor for your own wide-bore 510 driptip, in the case of a single-coil build. Second airflow-directing metallic clamp (and its spare screw) for the single-coil setup. This clamp-component of the RDA’s design will be thoroughly discussed later on. The RDA comes with a dual-coil airflow selecting clamp installed. Squonk pin with a double-sided e-liquid outlet. Enough spare orings and screws, a triple screw-driver and a cleaning cloth. A sachet with enough cotton and two 2*26ga+40ga*2(=)*16 Ni80 fused Clapton pre-build coils. For your first-time build right out-of-the-box (after its usual initial wash, even though the RDA comes crystal-clear cleaned). The “Wormhole” brand name can simply be attributed to the design idea. The design of encapsulating a single airflow tunnel under the larger post (negative one) looks like a wormhole. It carries the outside air into the centre of the base/deck to be guided. Then either one side of the posts only (for internally air-feeding a single-coil installed) or to both sides of the posts (for internally air-feeding two coils installed). This is the RDA’s internal airflow system. Such a direction-selective air-feeding system. Directing the incoming air to a single-coil only is performed by simultaneously blocking the air-feed to the empty side of the base. Only half of the base is functionally considered as “air-active”. For such an accomplishment, the design has equipped the deck with two different user-selective interchangeable. Air-direction regulating Π-shaped clamps that can be held in place centrally over the posts with a screw. The first clamp carries three air-holes only on its one “leg” (of the Π-shaped clamp) and the second one carries three air-holes on both of its “legs”. On both clamps, two of the holes are placed lower and one higher, for better air-coverage of the coils’ surface-area (laterally and underneath). This design makes the single-coils air-feeding performance quite efficient. 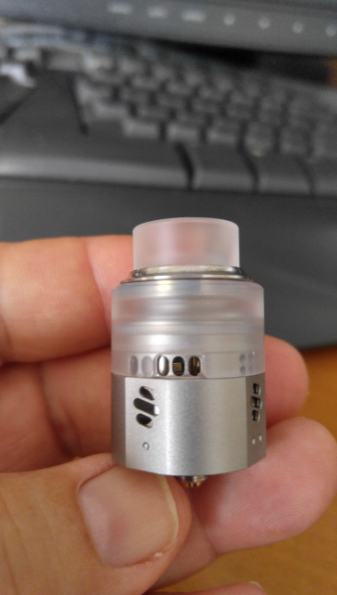 Similar to an actual 24mm-diameter single-coil RDA. While also keeping the air-feeding effectiveness high in the case of the dual-coil installation. The RDA’s top-cap consists of two parts in conjunction (independently rotating). 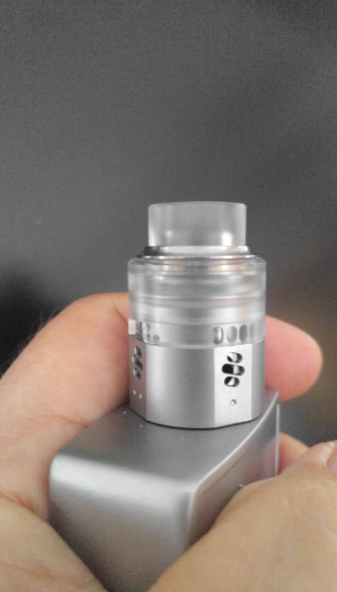 A metal SS lower part and a PMMA upper part (also for heat-insulating the drip tip). This two-part top-cap allows simultaneous side- and laterally below-airflow to the single- or to the dual-coil setups. The side-airflow comes from the external air-holes of the higher-tier of the SS top-cap, while the laterally below-airflow comes from the internal clamp’s air-holes. The lower SS top-cap carries two-tier sets of different air-holes that work together. With the use of the upper PMMA top-cap for simultaneously providing the necessary coils’ air-feeding selection. Of side- and laterally below- airflow in both cases of single- and dual-coil installation. With enough intermediate airflow choices available for your own preference. The external design of the lower SS top-cap “hosts” 4 opposite small flat-cut surfaces for also easily gripping it for rotation. For adjusting the total area of opened air-holes or for totally unscrewing it from the mod. Each one of the three small flat-cut surfaces carries three slanted vertically-placed air holes of different dimensions to be sited over the wormhole’s input hole. Adjusting the amount of air guided to the centre of the base in both cases of single and dual-coil builds. Note that there is a dotted designation guiding you which flat-cut to use accordingly for each case. For the dual-coil case, there is only one choice of air-intake (the double-dotted one). While for the single-coil case there are two flat-cut choices the single-dotted ones. To cover both possible cases of installing a single-coil inside the deck (at either side of the posts). The fourth “blind”-cut flat-surface is only engraved for your fingers to snag on. Actually, all four small flat-surfaces are helping to that in order to be able to easily rotate the lower SS top-cap around the base. 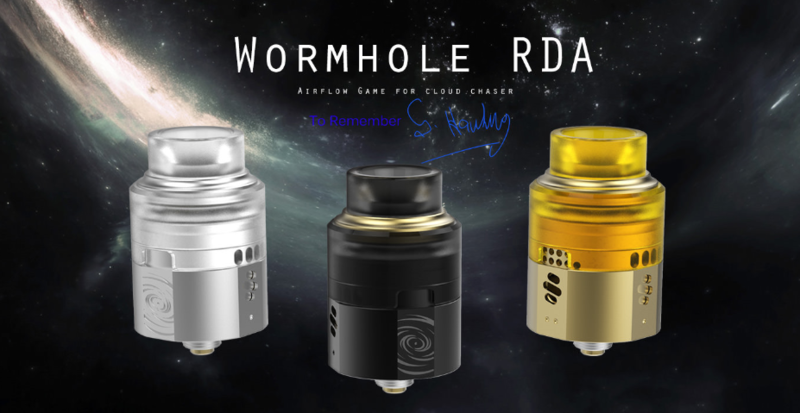 But, this “blind”-cut flat-surface is actually for totally blocking the wormhole’s air-input so that to also use the RDA as a “pure” side-airflow RDA. The upper PMMA top-cap carries two opposite-positioned notches. The bottom circumference for selecting the proper set of air-holes on the higher-tier SS part of the top-cap (the corresponding to air-feeding of the coils installed). This is the RDA’s external airflow system. The PMMA top-cap also carries a removable flat-surface metallic ring on its top. With a silicone-oring underneath it (for its proper air-sealing). This metallic ring encapsulates the oring that air-seals the hosted 810 Goon-styled drip tip. 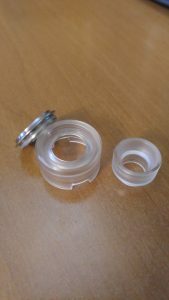 It is also used for “protection” of the PMMA top-cap from possible breaking in the long run (under frequently interchanging of drip tip). 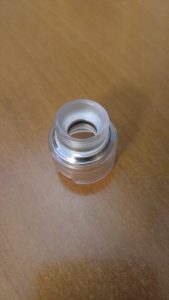 The internal top-part of the PMMA top cap is slightly domed-shaped (for the smooth guidance of the vapour to the drip tip). It carries a double-wall design, permitting the SS top-cap to fit in securely. Also sealed with a silicone oring fitted on the SS top-cap. The deck’s screws. Where the coils’ legs are tightened in place inside the posts’ slot-holes. Are equipped with wide flat metal clamps for easily inserting and tightening down both coils’ “legs” securely. The design of the posts creates a “bridge”. That underneath permits the protruding squonk pin’s double-sided output to easily saturate the cotton’s tails on both sides of the posts (for the dual-coil case). 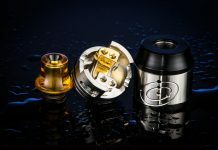 The base-well is deep enough for a liquid-feeding 24-diameter dual-coil RDA. Either for squonking or for dripping. Since the deck’s internal air-holes (on the clamp) and its external air-holes of the upper-tier of the PMMA top-cap are placed too high. There is no leaking issue from over-squonking. Note that the two black-rubber orings of the base are rather thick. So you’ll find the rotation of the SS top-cap too tight at first. Even after adequately “greasing” them at the first use. A couple of days later, they loosen up. 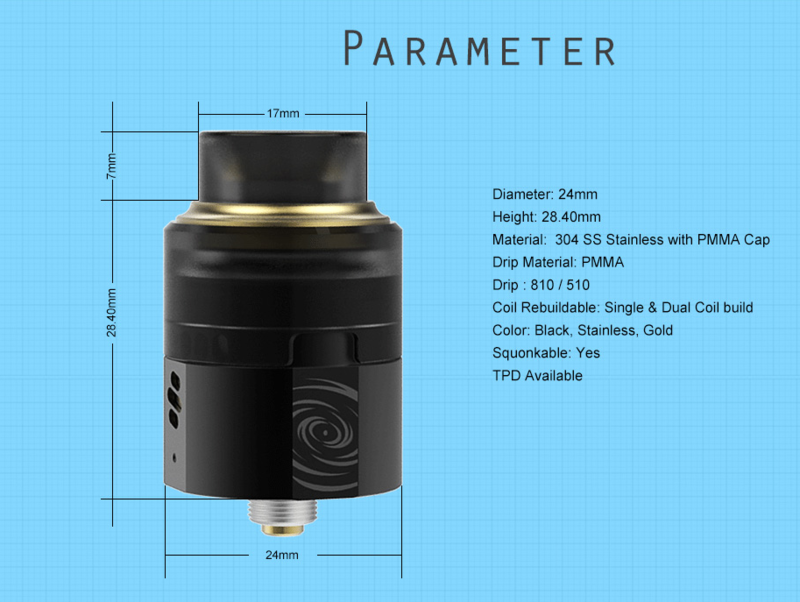 The Wormhole RDA produces a large quantity of dense vapour either with a dual-coil or with a single-coil build. 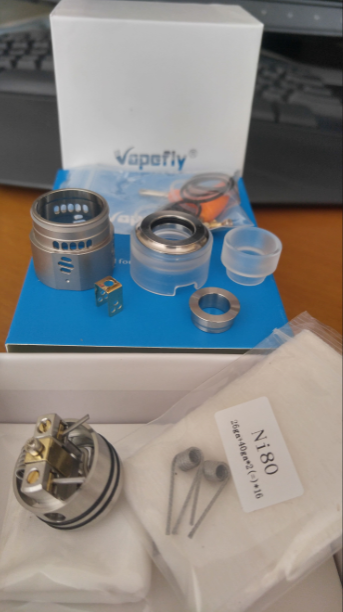 Its air-feeding system and its adequately-steeping ability make Vapefly Wormhole RDA a flavour-intensifying RDA. 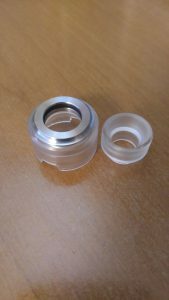 For both DTL (loose or restricted) and MTL (loose) vaping puffs (according to your airflow arrangement/adjustment). 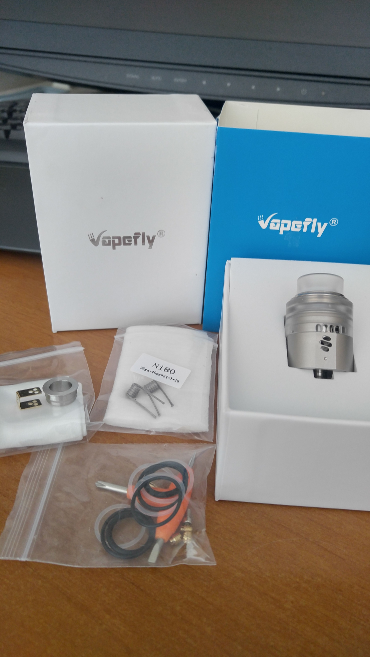 It can actually be considered as a trainer that will take you from your loose-MTL vaping style (with a single-coil build and your own 510-drip tip) and will guide you. Step by step, all the way to the end of a loose-DTL vaping style (with the dual-coil build). I am not in the vaping business. I found vaping as the escape door from my 25 years of smoker’s imprisonment. It just took me four days of attempting to totally get out of it, thanks to the appropriate –for me- “equipment” (includes e-liquids). Now, vaping “equipment” has become another one of my fields of interest, for helping others to discover, on their own, their personally appropriate “equipment”. I am a hands-on enthusiast… by genes. I am triggered by everything that evokes any data already stored in my knowledge base, been a Physicist and an Electronics Engineer (for more than 35 years). I am intrigued by everything new that my knowledge-filter considers interesting enough to be analyzed for entering into my memory compartment. That’s why you will find me open-minded and out-of-the-box thinking. I have an urge for unfolding hidden “pictures” of design thinking on everything man-made.